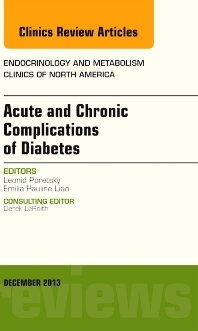 "A concise, well structured and extensively referenced compilation of 13 reviews around the theme of acute and chronic complications of diabetes, it offers a collection of succinct discourses that will enthral during the three months between this and the next publication....The physical size of the book is pleasing and it is comfortable in the hand. Each review is of just the right length to provide both enlightenment and education. On average each of the 13 reviews is of 20 to 40 pages in length, so the imparting of knowledge is lean, succinct and brisk. But paradoxically each provides a leisurely read that enables the clinician to ensure a rounded update on pertinent areas in the field....I can recommend this book as an investment that will provide months of quiet, enjoyable contemplation of the fascinating interplay between the conditions associated with diabetes and pathophysiology of diabetes itself."